Many existing information retrieval (IR) systems are surprisingly ineffective at finding documents relevant to particular topics. Traditional systems are extremely brittle, failing to retrieve relevant documents unless the user's exact search string is found. They support only the most primitive trial-and-error interaction with their users and are also static. Even systems with so-called "relevance feedback" are incapable of learning from experience with users. SCALIR (a Symbolic and Connectionist Approach to Legal Information Retrieval) -- a system for assisting research on copyright law -- has been designed to address these problems. By using a hybrid of symbolic and connectionist artificial intelligence techniques, SCALIR develops a conceptual representation of document relationships without explicit knowledge engineering. SCALIR's direct manipulation interface encourages users to browse through the space of documents. It then uses these browsing patterns to improve its performance by modifying its representation, resulting in a communal repository of expertise for all of its users. SCALIR's representational scheme also mirrors the hybrid nature of the Anglo-American legal system. While certain legal concepts are precise and rule-like, others -- which legal scholars call "open-textured" -- are subject to interpretation. The meaning of legal text is established through the parallel and distributed precedence-based judicial appeal system. SCALIR represents documents and terms as nodes in a network, capturing the duality of the legal system by using symbolic (semantic network) and connectionist links. The former correspond to a priori knowledge such as the fact that one case overturned another on appeal. The latter correspond to statistical inferences such as the relevance of a term describing a case. SCALIR's text corpus includes all federal cases on copyright law. The hybrid representation also suggests a way to resolve the apparent incompatibility between the two prominent paradigms in artificial intelligence, the "classical" symbol-manipulation approach and the neurally-inspired connectionist approach. Part of the book focuses on a characterization of the two paradigms and an investigation of when and how -- as in the legal research domain -- they can be effectively combined. Contents: Preface. Introduction. Humans, Computers, and Finding Information. Knowledge Representation, Meaning, and Text in AI. Approaches to Information Retrieval. Some Perspectives on the Law and Legal Research. Hybrid Vigor. The Structure of SCALIR. The Retrieval Process. Feedback and Learning. Interacting With SCALIR. Performance Evaluation. Discussion. "The book of Daniel E. Rose is important. 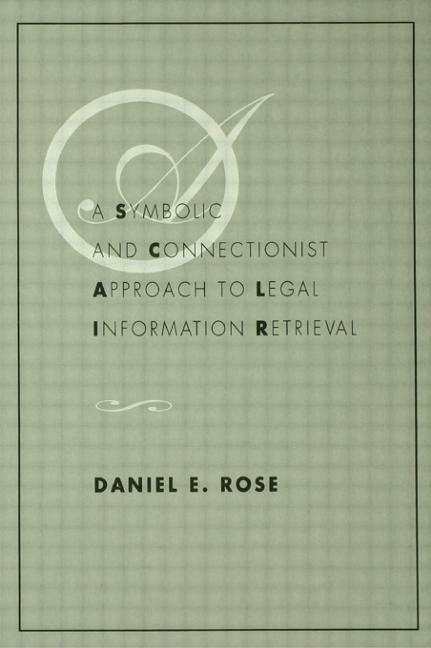 It is the most important book offering a general discussion of legal information retrieval in the perspective of an original approach for a long time, probably since Carloe Hafner's introduction of LIRS some 15 years ago." "Dr. Rose is clearly a man of the marketplace....The background chapters contain an extensive survey of the literature, particularly the IR literature, demonstrating a comprehensive knowledge of the issues in theory and system evaluation." "This book is one of the best I have read in the field of artificial intelligence and law, and I believe it is one of the best pieces of work in applied AI generally. The reason I am so enthusiastic is the experimental component of the work: its attempt to scale up to a more realistic size document collection, and its reporting of quantitative information about the knowledge structures which were used to represent this large text database. Dr. Rose has taken some very complex ideas and presented them with admirable skill."